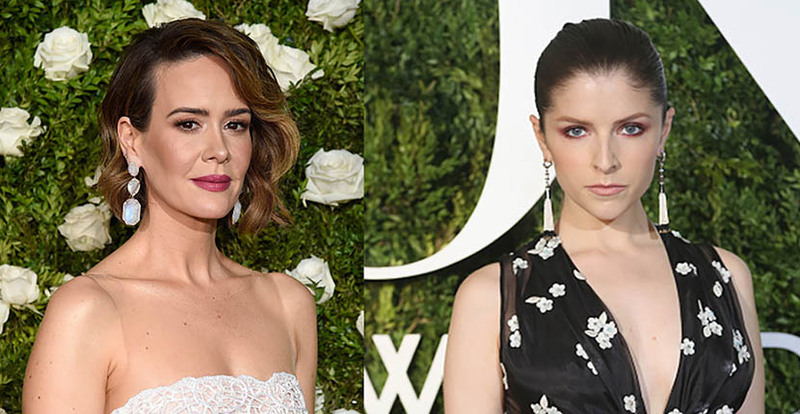 The Tony Awards honoring Broadway’s talent may not have the megawatt sparkle of the Oscars or Cannes, but there are lots of beautiful jewels that are more, well, New York. They are chic but understated compared to the over-the-top bling seen during Awards Season in Los Angeles. And for that reason, they are worth a review. These bejeweled looks, like ensembles worn by stars during the Photo Calls in Cannes, provide ideas you could realistically incorporate into an evening on the town to see a Broadway show. Uma Thurman paired 19th century amethyst rivière and cross pendant from Fred Leighton with a black button down blouse and long skirt. 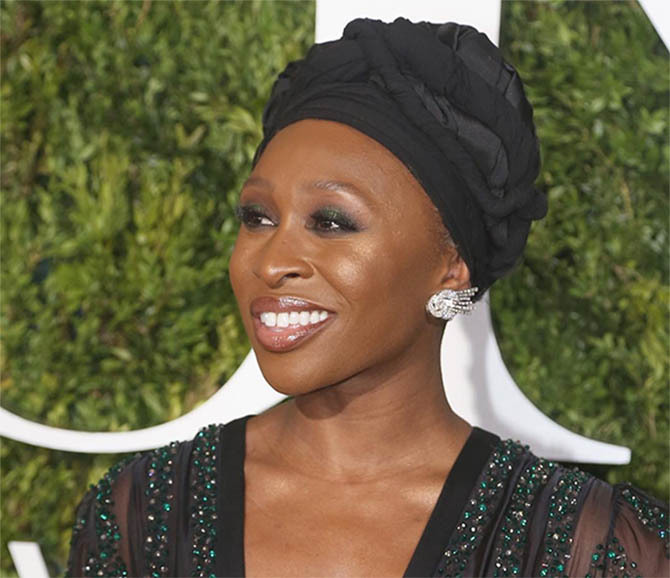 Cynthia Erivo looked sensational in dazzling mid-twentieth century diamond spray earrings from Fred Leighton and a black turban and gown. 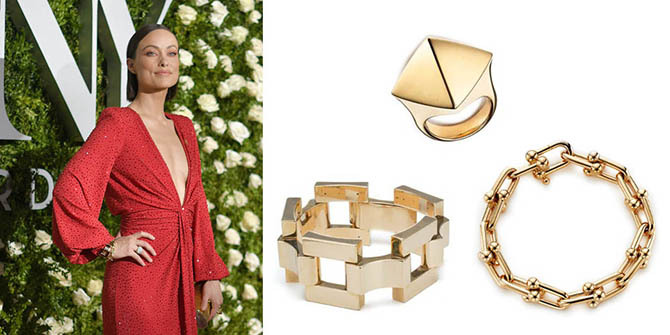 Olivia Wilde wore a handful of Tiffany jewels with her striking red Michael Kors gown. The pieces included small diamond bar earrings, a bold vintage link bracelet made around 1944 from the Tiffany Archives, a Tiffany HardWear link bracelet, an Out of Retirement gold pyramid ring and a diamond Schlumberger ring. 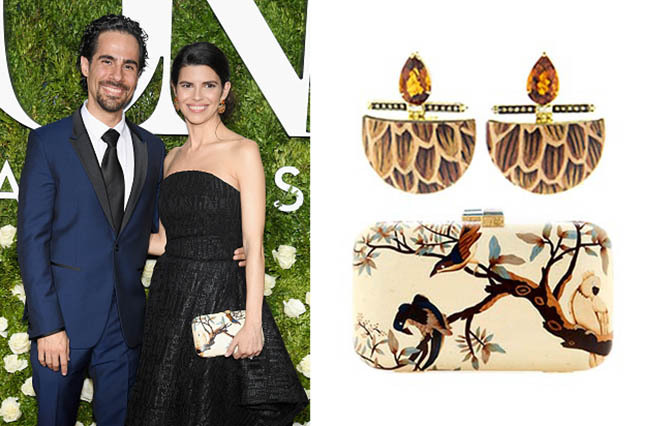 Anna Kendrick’s stylist Cristina Ehrlich masterfully mixed a printed Miu Miu gown with pearl tassel earrings from Cartier. 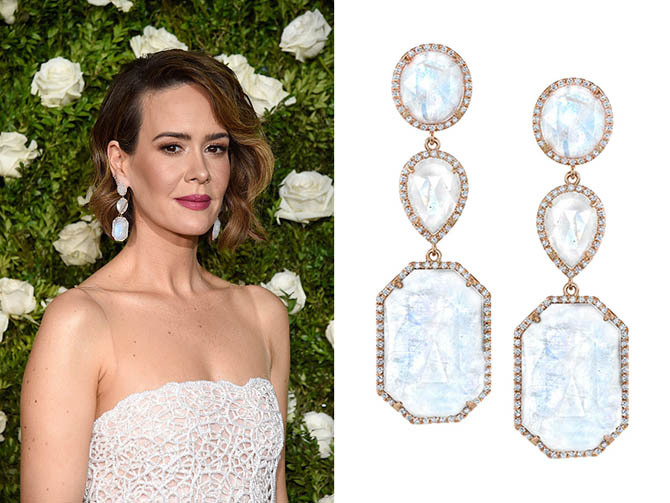 Sarah Paulson’s stylist Karla Welch created a cool look for the hot summer night in New York pairing a white strapless Rodarte gown and rainbow moonstone, diamond and gold earrings by Irene Neuwirth. Scarlett Johansson added sparkle to her white Michael Kors jacket and long skirt ensemble with antique diamond snake earrings from Fred Leighton. Alex Lacamoire and Ileana Ferreras who was beautifully styled by Stacy London in some of the hottest pieces shown at the Couture Jewelry Show. Ileana wore Silvia Furmanovich marquetry earrings and carried one of the Brazilian designers cult clutch bags studded with gems. Cynthia Nixon glowed in a blush pink Rosie Assoulin strapless gown with a vintage 1950s gold choker from Fred Leighton. Broadway star Sutton Foster looked sensational in a black gown and colorful David Webb earrings and rings. Stephanie Block sparkled on the red carpet in a J. Mendel gown and pendant earrings from Larkspur & Hawk.